If you’re using a Valentine One paired with an iPhone, let’s talk about how you can program your V1 to help improve its performance while also cutting back on false alerts. The V1 has some helpful third party iOS apps like V1Driver to add some additional muting functionality use you can use while driving (ie. 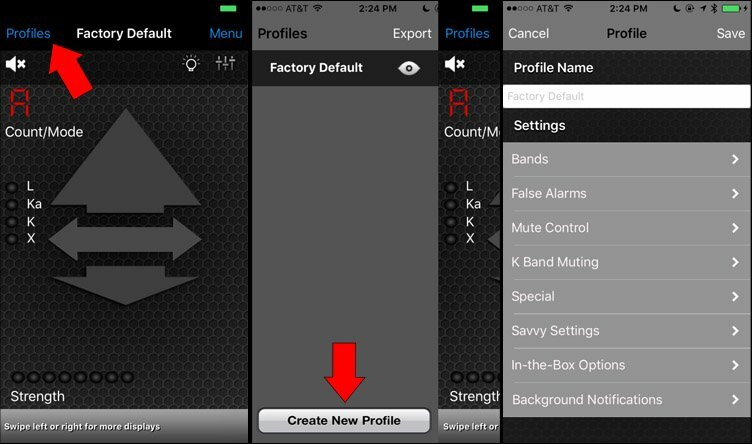 low speed muting and/or GPS lockouts), but to program your V1, you’ll want to use the factory app, V1connection. Here’s the video walkthrough of this tutorial. The complete written version of this article follows below. In order to do this, you’re going to need 4 things. -A newer Valentine One. You’ll need one that’s version 3.892 or newer to support bluetooth communication. I recommend 3.894 or newer to get the latest version of their K band filter. Watch this video to learn how to check what version V1 you have. -V1C LE. This is the iPhone version of the Bluetooth module. Click here to order the BT module. -V1connection app. Download the app here. The V1connection app works by creating different profiles. 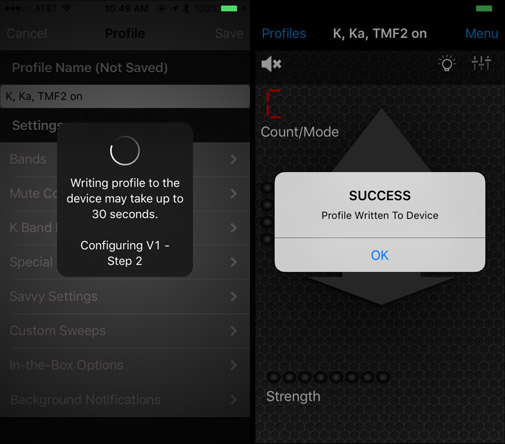 Rather than having one set of settings programmed in your V1, you can have multiple different profiles, each one with different settings that you can easily switch between on the fly. This is helpful if you need to change your settings depending on where you’re driving, if you want to experiment between settings that give you better filtering versus better performance, and so on. To create a new profile, from the main screen click on “Profiles” up in the top left and then click “Create New Profile” on the bottom. Then in the text box up top, you’ll type in a name for this profile, something descriptive that lets you know what this group of settings is for. 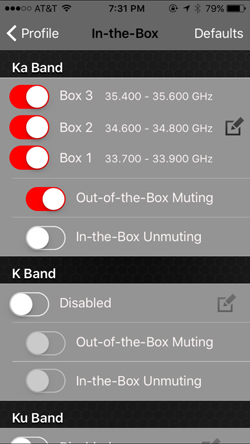 A common group of settings would be things like X band off, K band on, Ka band on, and TMF2 on. X band isn’t in use in most of the country while K and Ka bands are. TMF2 is the Junk K Fighter which significantly helps cut down on false alarms from cars with blind spot monitoring systems as well as from radar-based traffic monitoring sensors on the sides of some highways. So the profile name that I generally run is “K, Ka, TMF2 on,” but feel free to name your settings whatever you like, based upon your own needs and preferences. To start off, we’re going to want to enable the setting that will allow us to unlock the full potential of the V1. When we do this it will actually change what options are available for us to configure in the first place so we’re going to start with this first and then work our way through the list. Click on “Special” and then enable “Euro mode.” This will change what features we now have access to such as custom sweeps, allowing us to unlock the full performance potential of the V1. Despite the name, this is helpful even if you live in the USA. As for the other settings in that menu, let’s take a look. 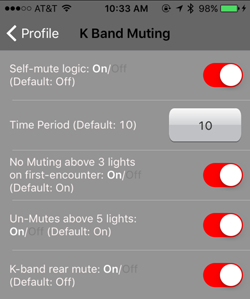 Valentine One Mode: This allows you to choose if you want both K and Ka band on or just Ka band. I never bother with this because you can switch between the two by pressing and holding the big button on the front of the V1 so it’s super easy to enable and disable K band on the fly which is super helpful when you’re driving through an area with lots of K band falses and no legitimate K band alerts. This way you can cut off K band altogether and not have to bother with the K band filters. If K band is used in your area, definitely leave K band on. Note: When you’re in Euro Mode, instead of an “A,” “l,” or “L” on the front of your V1, it will display a big “U” on the front when K band is on and a little “u” when K band is off. Once you then load in your custom sweeps which we’ll do shortly, you’ll get a big “C” when K band is on and a little “c” when K band is off. 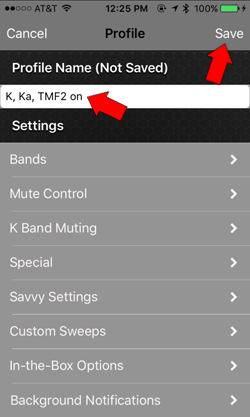 TMF & Junk-K Fighter: This is a super helpful feature that will help cut down on a lot of false alarms on K band. It’s designed to help filter out false alerts from radar-based traffic monitor sensors on the side of some highways (traffic monitor filter) and it’s also been tweaked to help filter out false alerts from cars with radar-based blind spot monitoring systems and collision avoidance systems. Turn it on to help cut down on a lot of false alerts. If you live in a rural area without traffic sensors or other cars with blind spot sensors around you, turn it on for maximum K band performance. This is an area where having multiple profiles to switch between may come in handy. Dark Mode: Disable your V1’s display altogether when driving. This is handy if you don’t want others around you to see the blinking lights in your car and give away the fact that you’re using a radar detector. If you still want to see the V1’s information like arrows or signal strength, you can look at your phone instead. Alert Persistence: After an alert goes away, this will keep the alert on screen but slowly fade it away over time. You get this white “ghost” image which is nice for glancing back at the screen after the alert is gone and seeing what that was. On is helpful. In this area we can turn some of the individual bands on and off. Note: If you haven’t enabled Euro Mode yet, this screen will look different, along with some of the other screens. Laser: The V1 does an awesome job at detecting laser. It’s the most sensitive laser detector built into any radar detector on the market. It’s also prone to false alerts from cars with laser-based cruise control and collision avoidance systems, ie. Volvo, Infiniti, Mazda, etc., so you will get some false alerts on laser. Because of this reason, and also because laser detection on a radar detector is of very limited value, I turn laser off altogether on my V1 and let my laser jammers handle laser entirely. If you’re not running jammers yet, you can leave laser on, but be aware of potential false alerts. 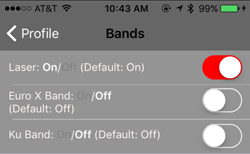 Euro X Band: X band isn’t in use in most of the country so it’s generally safe to leave it turned off. You’ll only see it in a few places like OH, NJ, some places in OR, and a few other places here and there. It’s for this reason that most people turn it off and don’t both with dealing with the false alerts. The best resource around to see what bands are used in your area is the RDFGS. The video below will provide more information on how to use the RDFGS. Note: Unfortunately it’s not very accurate for X band as it’s hard to know when it’s safe to remove stagnant info. See this thread for more up to date info. Ku Band: Leave this off in the US and Canada. It’s only used in a few places overseas so don’t worry about it otherwise. Muted Volume: Default is good. 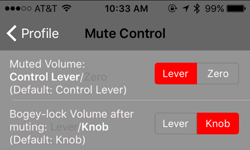 This lets you change the muted volume from being controlled by the outer lever around the main button of the V1 to having it be totally muted (zero) altogether. It’s nice having some fine tuned control over the “muted” volume if you like. Bogey-lock Volume after muting: When you get a new signal, the V1 alerts with a “new bogey” tone. If you want to control this tone separately from the muted volume, you can set it to lever or knob. I prefer knob (the default) since this keeps it in line with the normal volume. Self-mute logic: Turn on to enable this additional functionality. Time Period: How long to wait before automatically muting the alert. No muting after 3 lights on first-encounter: Don’t mute the signal if it’s more than 3 dots strong on the strength meter. This is good so you get alerted to stronger instant on shots. Un-Mutes above 5 lights: If the signal gets stronger and stronger, to the point where you’re now really close, go ahead and alert. K-band rear mute: Mute any K band signals coming from behind where it’s likely less of a threat if real. Good way to help cut down on the false alerts around town. Savvy Unmute: Once you drive faster than the threshold speed, alert to signals that savvy has been muting up to this point. Override Savvy Thumbwheel: Override the speed you’ve set on the physical savvy plugged into your OBD-II port. This is convenient if you don’t want to dig down into your car to change the settings. You can do it from your phone instead. 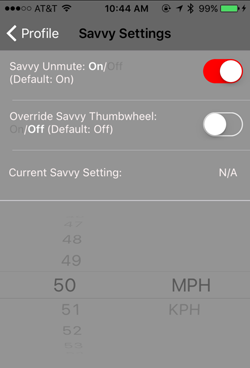 Current Savvy Setting: Choose your savvy threshold speed if you’re overriding the thumbwheel. The idea behind custom sweeps is that scanning all of Ka band is kind of a slow process since there’s so much to scan. By telling the V1 to not waste time scanning the frequencies where there’s no legitimate police radar in the first place, you speed up its scanning which makes it faster and also gives you longer range. Very helpful. 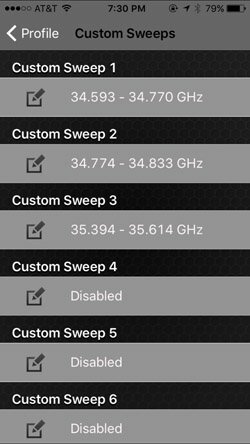 There’s different options you can choose when setting your custom sweeps. I’m going to give you a very simple set of sweeps that’s good for all 50 states. Yes you can try to tweak things further, but for most people starting out, I find that this is more confusing than beneficial, so let’s keep things simple and set your V1 to scan 33.8, 34.7, and 35.5, +/- 100 MHz, the frequencies that police use in the US and Canada. We’re also going to scan a tad wider to cover any police radar guns that are transmitting slightly outside the range they’re supposed to. The way we do this is a little weird. 33.8 is automatically scanned by the V1 no matter what. You can’t disable this even if you wanted to. Because of this, you don’t have to scan for 33.8. 34.7 is also a little weird. Because of the way the V1 is designed, we have to break up the 34.7 sweep into two sections. There is a little bit of a gap between the two sections, but don’t worry. The V1 is designed to oversweep to cover that gap between the sweeps. 35.5 is the only normal one, haha. We can do this in just one set of sweeps. You can leave the other 3 spots blank. If you want to learn all about custom sweeps, read this article. One of the best benefits of this option is that you can mute some false alerts that will happen from drivers near you running Cobra brand radar detectors. Unfortunately those are pretty poorly designed detectors and they leak signals that can make your V1 go off. 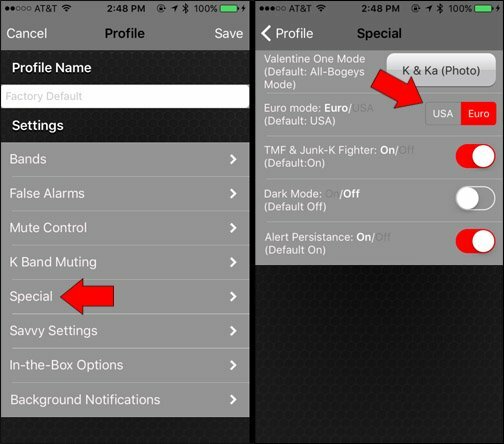 Your V1 has a filter designed specifically for this called Ka Guard, but it goes away once you enable Euro Mode. Ka Guard helps with false alerts, but it’s pretty detrimental to performance and range. So what we can do instead is now that the filter is disabled, we can use boxes to tell the V1 to mute signals that are no longer getting filtered out. Cobra falses often happen in the 33.6xx range. There’s others frequencies too, but these are the most common. Remember how I mentioned in the last section that we can’t disable the 33.8 sweeps? Unfortunately we also can’t disable the 33.6xx sweeps that would pick up on the Cobras. So let’s set some frequency boxes where legitimate police radar will be and tell our V1 to mute any signals that fall outside of that range. Enable Box 1, 2, & 3 to cover 33.8, 34.7, & 35.5. The enable “Out-of-the-Box Muting” to mute any signals that fall outside that range, such as 33.6xx Cobra falses. In-the-Box Unmuting will unmute any signals inside the range that may be muted by other settings so you always get alerted to frequencies in that range, but it disables the mute button on the front of the V1 which is a very helpful button so I don’t recommend using this. Choose which ones you want to be notified for. Leave default settings if you’re not sure. This is nice so that when you have the app running in the background and get an alert, a little banner will come down from the top of your screen and you can tap on it to easily get back into the app to see the frequency of the signal or get more information in general. I actually run with the background notifications turned off. The app likes to nag you when you put the app in the background. Plus I generally just use this app for initial programming of the V1 and I’d use a different app like V1Driver or StealthAssist when actually driving to add some additional functionality. You can only run one at a time so I don’t need V1connection for its background alerts. However, if this is the app you run when driving your car, the background notifications can be helpful. Once you’ve got everything all set up, give your profile a descriptive name and then click the Save button up top. This will save your profile’s settings and then copy those settings over to your V1 for you. The programming process takes a few seconds. Once it’s done you’ll see a confirmation on screen. At that point you’re all set! If you want you can create additional profiles with different settings to switch between. Maybe X band on or off, TMF2 on or off, Laser on or off, etc. StealthAssist is a free app that adds low speed muting to quiet your detector down around town. It’s similar to Savvy except it uses your phone’s GPS to get your speed instead of requiring you to buy and use Savvy. V1Driver is an app that adds low speed muting like StealthAssist except that it also adds GPS lockouts to help it learn and lock out (mute) false alerts that you pass by again and again. This feature is available on YaV1 for Android and V1Driver is bringing over to iOS users as well. The app is currently being developed and beta tested and will be available for sale on the app store soon. What should you do after turning on TMF filtering and it is your own blind spot radar that is setting off the K-band? One of the BSI frequencies is 24.200 and the other is 24.249. There is no option to turn the Blind Spot Radar. umm, sell your Acura so you quit causing falses for yourself and everyone else on the road? Kidding… sorta. :p Acuras are actually really really tough to filter out. Some of the hardest. If you’re getting falses from your own car, you really don’t have much of a choice other than to shut off K band altogether or go with a smarter detector like a Stinger VIP which has an in-car radar filter for this exact purpose. Thanks for the input. There isn’t a way to custom sweep my way out of this? I take it there’s no way to skip those two freqs on the K-band? For the most part, yeah. V1Driver gives you the core functionality like GPS lockouts and low speed muting, plus it’s more automated and battery friendly than YaV1, but it does have a different alert presentation (I prefer YaV1’s), you have to have a second app to configure your V1 and you can’t have custom profiles to switch between on the fly, you can’t do boxes with V1Driver, and so on. If you’re using an iPhone 6 too, V1Driver is definitely the way to go in general. It’s a pretty awesome app and you don’t have to worry about carrying a second phone, having an additional phone mount and charger, the phone battery dying if it sits in your car for a few days, and all that. Thanks very much. You do a nice job here. Sorry if this is a silly question, but what happens if I set-up custom sweeps etc with the V1 apple app, save it, and then disconnect the V1C LE, will the valentine one still remain in C mode ? So lucky me, I live in NJ and have to worry about X-band. However you don’t cover it above. Which is understandable since it is only an issue in a small population. So the question is how do address it in the above guide. Turn it on if you live in NJ and need it. I go into a little bit of detail down in the Euro X Band section, but not as much at the beginning of the article, you’re right. So then no “extra” settings needed using the app? Savvy which uses the OBD port for power will set off the alarm on your 2017 5 series bmw when you lock the car. haha yikes, good to know! I am having a problem with savvy where when i let the car sit for a long time, the radar forgets the profile. When I open the v1 app it says this is a new profile would you like to save it even though nothing has changed. Just got the V1Driver because of your video. Thank you for all the great video instructions! Question, my V1connect will not connect to my Car Bluetooth after Savvy and V1Driver. I don’t think I need V1Connect anymore now that I programed my V1, am I correct? Once you program and select a profile it stays in the V1, yes? You got it! V1Connection is used just for initial programming. V1Driver is then what you’ll run day to day. Just make sure V1Connection is closed and not still running in the background when you launch V1Driver because you can only have 1 app connected at a time. Just because I don’t use boxes for K band. 🙂 It could be an idea nowadays to mute 24.194-24.206 or so to mute Hondas/Acuras though, if you like. How would one program a box to ignore blind spot monitoring frequencies, like the Honda/Acura frequencies you mentioned and also a false I got from a GM vehicle @ 24.184? 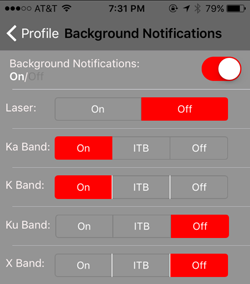 Create a box for the frequency range and then tell the app to mute alerts that arise inside the box. I think the issue I am having is where to do this in V1 Connection? I see, and have programmed, the KA custom boxes, but nothing for muting in the box K band alerts. Can you help me out with this please? Sure. I haven’t used the app in ages since V1Driver is WAY better to use when actually driving. However, if you go into the profiles, there’s a menu option for In-The-Box Options. You’ll find it there. Yeah, In-The-Box only seems to offer one box selection, not multiple ones like Ka band. V1Driver is an iOS only app, right? I am using Android. Do you happen to know if YaV1 offers multiple K-band box filtering? I don’t remember off the top of my head. You can look through my YaV1 tutorials to find out. V1Driver is for iPhone, but there’s an Android version coming soon. There’s also JBV1 coming as well so lots of Android V1 apps in development. after following your instructions, many times over, I still have the U and not the C after saving my profile. You’ll get the U when you switch into Euro Mode. Once you load in Custom Sweeps, it’ll switch to a C.
Are these custom sweep ranges still valid? There’s always exceptions to the rule, but yes. Customize your custom sweeps. They are intended to help cut out false alerts if you sweep wider, but if you need wider sweeps, use wider sweeps. Generic sweeps are not intended to be one size fits all. Ok. I was going by the “all 50 states” comment in the related video and wasn’t sure if expanding the sweep would reduce performance (by virtue of increasing the RD workload) just to potentially capture that ONE radar in upstate NY in that ONE patrol car from that ONE hick town lol. Hi. I am using the remote display but I would like the lights to show on the main Valentine One Detector as well. I can’t seem to get them both to light at the same time. Can anyone help? Thanks. I’m not sure if you have control over that. It just shuts the V1’s display off when you hook up a CD. However, if you’re also paired with your phone, there’s an option to turn dark mode on and off which’ll turn the V1’s display on and off. The concealed display will always be on, however. So the phone is the trick. I just want to use the bluetooth for programming. Just want to confirm that once that is done I don’t need to have the bluetooth module attached . For programming, correct. If you want additional GPS-related functionality that requires your phone’s GPS, you’ll need to run another app while driving.